Daryl Johnson (Worcester Park, United Kingdom) on 1 September 2011 in Sport & Recreation. A good mixture of appropriate and inappropriate beachwear for an August day at the English seaside - who do you reckon had the most realistic idea...? Well, I reckon the guy extreme left had ideas on what was the best view, that's for sure ! @Ronnie 2¢: I think he was trying to make some kind of statement. From what you said yesterday, the lady with the sweater. ;-) We get a marine layer here in August that cools us off and causes gray days. 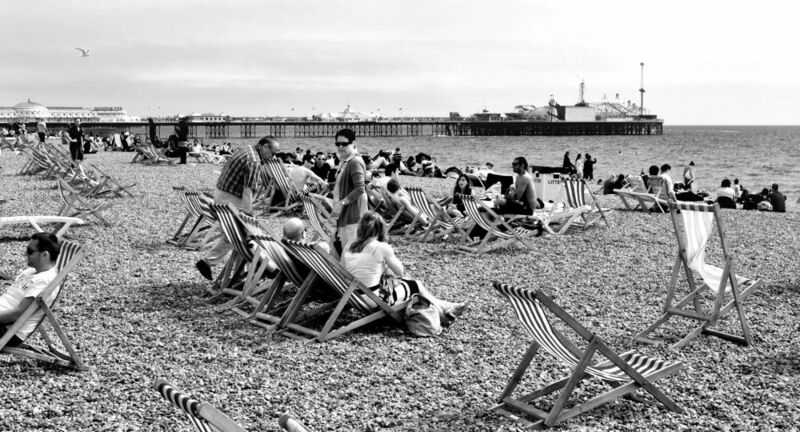 @Steve Rice: Yep Steve, it was a chilly old day, but British people do like to be beside the seaside. I fancy inappropriate beach wear on some beach goers. @Twelvebit: Not on a British beach through Twelvebit...!